An all time classic. From Tommy Simpson to Robert Millar, riders wearing the iconic chequered flag jersey have looked the business. It was the first kit I wanted as a kid and I still wear one most weeks. Best matched with plain black shorts and a Peugeot cycling cap – with the peak turned upwards, of course. Love the sparseness here. Bold colour, simple logo. Job done. Not quite so well known as some other teams of the era but Luis Ocana won the 1970 Vuelta and 1973 Tour in the orange of Bic. Best paired with jet black hair and an epic tan. The hint of the Hacienda’s famous black and yellow warning stripes helps this one into third spot. The design morphed subtly into the Renault Elf jersey and then more radically into the Systeme U jersey, both of which are great in their own right. 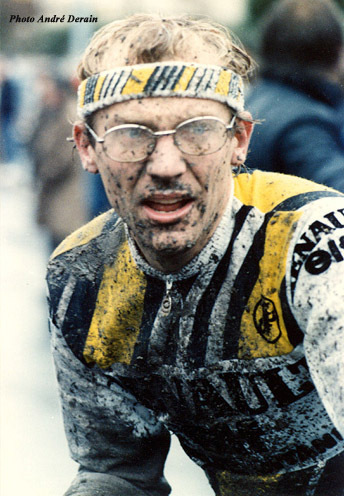 Best paired with a matching headband a la Fignon. Hinault. Lemond. ’86. Enough Said. This entry was posted in The Jersey Pocket Podiums and tagged bic, Cycling, jersey, la vie claire, peugeot, renault, Style. Bookmark the permalink. The Peugot is pure nostalgia – they don’t make them that minimal anymore and more’s pity. Not exactly Vini-Fantini is it? Yeah, and hard to imagine a kit staying basically unchanged for 23 years now.